No scratches or dings, clean glass, smooth zoom operation. The famous 3D pop from Zeiss is real. I have taken most of my best shots with this amazing glass, paired to a Sony a6000. Pleasant bokeh and almost macro capability. Sony SEL1670Z Vario-Tessar T* E 16-70mm f/4 ZA OSS Lens. Condition is excellent, gently used. Shipping includes: Lens Original box front and end caps hood pouch. Condition is Used. I am the sole owner and user of this lens. It looks new with no marks or scratches. Included with the lens are Hoya 55 mm UV and circular polarizing filters. The lens is in excellent condition (Almost like new, see photos). Used in very good condition. Cracked lens hood as pictured still fully functional and clicks to lock on. Lens was recently serviced by Sony Pro Support and is in perfect working condition. All original packaging and 55mm B W filter included. Lens is used but in great condition.see photos. SONY Vario-Tessar T* E 16-70mm F4 ZA OSS SEL1670Z for E Mount Used with hoya 55mm MC Protector. Condition is Used. Shipped with USPS Priority Mail. Sony Vario-Tessar T E 16-70mm f/4 ZA OSS Lens. Autofocus Yes. Focal Length 16 - 70mm Comparable 35mm Focal Length: 24 - 105 mm. The product may or may not include the original manual, but access to an English product manual should be available via the internet. • Linear Autofocus Motor; Internal Focus. Camcorder Kits (Body \ Lens). The product may or may not include the original manual, but access to an English product manual is available via the internet. Sony Vario-Tessar T E 16-70mm f/4 ZA OSS Lens. Sony E-Mount. ALC-SH127 Lens Hood. Lens Carrying Case. Carl Zeiss T anti-reflective coating enhances contrast, clarity, and color reproduction by countering the effects of lens flare and ghosting. SONY Vario-Tessar T* E 16-70mm F4 ZA OSS SEL1670Z for E Mount New. Condition is New. Shipped with Economy Shipping. the lens is in absolute great shape. Furthermore, the lens benefits from Zeiss' T anti-reflective coating to effectively eliminate ghosting and flare. A linear autofocus motor and internal focus design provide quick and precise autofocus performance and enables accurate and silent focusing while recording videos. The renowned Zeiss T (T-star) coating minimizes glare and ghosting that can degrade image quality, contributing to natural color reproduction as well as superb definition and clarity. The 4x zoom range of this lens extends from 24mm to 105mm (35mm full equivalent), making it ideal for a wide range of common subject and situations. The 4x zoom range of this lens extends from 24mm to 105mm (35mm full equivalent), making it ideal for a wide range of common subject and situations. In the Anti Motion Blur and Handheld Twilight modes this technology makes it easier than ever to shoot clear, blur-free, low-noise images at night, indoors, or in any conditions that would otherwise be a challenge due to low light conditions, without having to boost sensitivity or use a tripod. Sony Vario 16-70mm f/4 Aspherical ED ZA OSS Lens. Shipped with USPS Priority Mail. Lens is in LIKE NEW condition, no issues at all. Received the lens as a gift from my wife last year for my Sony a6000 but never really used it. I sold the a6000 separately and am now listing this. Message me with any questions. Thanks for looking. Used twice. Very sharp lens, renders beautiful colors. Sony Carl Zeiss Vario-Tessar T E 16-70mm f/4 ZA OSS SEL1670Z Lens. Linear Autofocus Motor; Internal Focus. Autofocus Yes. Focal Length 16 - 70mm. Angle of View 83° - 23°. Comparable 35mm Focal Length: 24 - 105 mm. Get closer to the action - with a 16 to 70mm focal length, you’ll be able to pick out every detail at any distance. Smooth, responsive AF - the Linear motor driven internal focusing technology provides near silent zooming, so you can shoot movies and stills in style. Trending at $705.30eBay determines this price through a machine learned model of the product's sale prices within the last 90 days. Sony SEL1670Z Vario-Tessar T E 16-70mm F4 ZA OSS E-Mount Lens. Vario-Tessar T E 16-70mm F4 ZA OSS. You can shoot at the maximum F4 aperture throughout the zoom range, and internal focusing provides smooth, quiet zooming. Sharp, clear night scenes or indoor shots in dim lighting can be captured without the need to boost ISO sensitivity and risk increased noise. Here’s class-leading ZEISS optics with the legendary T coating in a mid-range zoom that is compact and convenient for a wide range of subjects. Usefull Link. This Dust will no effect your picture quality. NEW ARRIVALS. Functions: Works properly. Restoration required, parts may be broken or missing. Works okay, with heavy signs of use. Works okay, with signs of use. MPN: SEL1670Z. Model: Vario-Tessar T E 16-70mm F4 ZA OSS. Compatible Mount: Sony E. Lens Pouch. 100% Authentic Genuine Products. Comparable 35mm Focal Length: 24 - 105 mm. Maximum F4 aperture across full focal range. Get closer to the action - with a 16 to 70mm focal length, you’ll be able to pick out every detail at any distance. No more high ISO settings - shoot at the maximum F4 aperture across the full focal range for stunning, no-noise images – without bumping up your ISO. : Sony SEL E Vario-Tessar TE 16-70mm F4 ZA OSS (SEL1670Z). Furthermore, the lens benefits from Zeiss' T anti-reflective coating to effectively eliminate ghosting and flare. 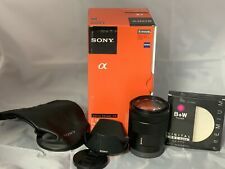 - : Sony Vario-Tessar T E 16-70mm f/4 ZA OSS Lens, ALC-SH127 Lens Hood, ALC-F55S 55mm Front Lens Cap, ALC-R1EM Rear Lens Cap, Lens Pouch. Autofocus Yes. 1 x ALC-SH111 Petal Lens Hood. 1 x Lens Carrying CaseProduct Heightlights Sony E-Mount. Phone Acceessory. Phone Case. Focal Length 16 - 70 mm. Comparable 35mm Focal Length: 24 - 105 mm. Outstanding contrast and resolution throughout the image area at all zoom settings are the hallmark of this high-performance Carl Zeiss mid-range zoom lens. The renowned Zeiss T (T-star) coating minimizes glare and ghosting that can degrade image quality, contributing to natural color reproduction as well as superb definition and clarity. 1 x Sony 70-400mm f/4-5.6 G SSM II Zoom Lens. Its great zoom range is well benefitted by the inclusion of a high-performance focusing system that revolves around the Super Sonic wave Motor (SSM) for smooth, fast, and quiet AF performance. Carl Zeiss mid-range zoom lens. High lens technology in a compact body. When using a flash, always remove the lens hood and shoot at least 1 m (3.3 feet) away from your subject. EAN Does Not Apply UPC 027242868229 Brand Sony Camera SLR Focal Length 16-50mm Focal Length Type Zoom MPN SEL1650 Compatible Brand For For Sony Camera Technology Digital Maximum Aperture f/3.5-5.6 Series Sony Vario. Sony SEL1670Z Vario-Tessar T E 16-70mm F4 ZA OSS. Sony Vario-Tessar T E 16-70mm f/4 ZA OSS Lens. ULTIMAXX LENS CAP KEEPER. ULTIMAXX LENS CLEANING PEN. ULTIMAXX 0.43x Wide Angle Lens - 55mm. ULTIMAXX Tulip Lens Hood 55mm. Included with your bundle. With write speeds up to 90 MB/s and recording at the UHS Speed Class 3. Lens Type : Mid-range Zoom. Autofocus Yes. Experience stunning Carl Zeiss® quality in a compact mid-range zoom lens.